How Risky Is Citigroup Stock? Citigroup is not a low-risk stock, and here's what investors should know. Even though the financial crisis ended several years ago, some of the big U.S. banks still make investors nervous, and Citigroup (NYSE:C) is certainly a good example of this. While most would agree that the bank has tremendously improved over the past few years, there are still some significant risks that Citigroup shareholders should be aware of. Here's a rundown of some of the major risks facing Citigroup, and whether or not they should scare you away from the stock. One of the reasons most bank stocks have performed poorly in 2016 is because they have substantial lending exposure to the energy sector. Citigroup is no exception, with $20.5 billion in funded exposure to energy related companies, and $58 billion in overall (including unfunded) exposure. The problem with Citigroup is that we don't know just how much in energy-related losses the bank is prepared to absorb. The other three largest U.S. banks have all provided some guidance on their energy loss reserves. Bank of America has reserved $500 million to cover losses in its $21.2 billion funded energy portfolio, JPMorgan Chase is aiming for $750 million in reserves against $13.8 billion in funded loans, and Wells Fargo is setting aside $1.2 billion on $17 billion in loans, clearly expecting higher default rates than its peers. However, all Citigroup has said is that it has added $300 million to its energy-related loan loss reserves during the fourth quarter of 2015. In fact, Citigroup CFO John Gerspach directly declined to disclose Citigroup's energy-specific reserves, instead saying that Citigroup is taking "appropriate reserving action." The bank has said that if $30 oil prices linger, it expects about $600 million in losses in the first half of 2016. The bottom line is that nobody (including the other three major banks) knows just how long low oil prices will persist, or how it will translate into defaults. However, we do know that just 68% of Citigroup's funded energy loans are investment grade, so it's natural for investors to be worried. This is a legitimate risk factor. Another major risk factor facing Citigroup is its exposure to international markets. While peers like Bank of America and Wells Fargo have mostly domestic loan portfolios, Citigroup is a truly international bank. As of Citigroup's latest SEC filings, approximately $280 billion of Citigroup's $645 billion in consumer and corporate loans are international -- about 43% of the total. This not only exposes the company to uncertain default risks related to foreign economies, but opens it up to currency and political risks. For example, my Foolish colleague John Maxfield recently pointed out that Citigroup has more than $1 billion in net exposure to Russia, whose currency depreciated by 16% against the U.S. dollar in the third quarter of 2015 alone. Granted, this is a small portion of Citigroup's total international exposure, but the point is that lending in foreign markets creates another layer of risk to deal with. In fact, Citigroup's total loans declined by 4% year over year, but three-quarters of that was due to currency headwinds. Admittedly, it's tough for anyone to fully understand the potential effects of Citigroup's international exposure, which is one of the reasons Citigroup is valued lower than peers. In the aftermath of the financial crisis, Citigroup started putting its unwanted assets in a division called Citi Holdings, and has been strategically disposing of these assets ever since. And, some good progress has been made. In the first quarter of 2008, Citi Holdings had a staggering $827 billion of assets on the books, and as of the end of 2015, this has been reduced to just $74 billion. However, $74 billion in undesirable assets is still quite a lot. Currently, 2% of Citi Holdings' $45 billion in loans are 90 days delinquent, and that's when the economy is pretty strong. The bank has set aside enough reserves to cover losses equal to 4.5% of the loan portfolio, so if the economy takes a dive, this could potentially lead to more losses than the bank is prepared to absorb. Now, for the good. There are several reasons to buy Citigroup, despite the risks. First, the bank is growing in the right ways. I mentioned that the loan portfolio declined overall for 2015, but this was due to continued reductions in Citi Holdings. Citicorp's (Citigroup's core business) loan portfolio actually grew by 5% during the year. And, the bank's deposit base also grew by 5%. The bank is well-capitalized, and is actually starting to post profitability and efficiency figures that would be expected from a well-run bank. Citicorp produced a return on assets and return on equity of 0.94% and 9.2% in 2015, just shy of the 1% and 10% industry benchmarks. Finally, I think the valuation of Citigroup's stock more than makes up for the risks. 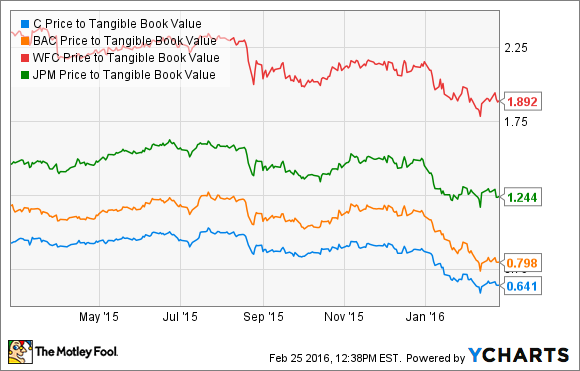 As of the end of 2015, Citigroup's tangible book value per share was $60.61, and shares now trade for a 36% discount to that amount, well below the valuation of peers. To sum it up, Citigroup is perhaps the riskiest of the big four U.S. banks, but the stock trades at a price that reflects this fact and then some. While the risks I discussed are indeed real, I think the bank has come a long way in its ability to prepare for potential risks, and that the stock has a lot of upside potential from its current price.